Apple had released its most advanced and newest iOS 3D Maps with the release of Apple iOS 6 Firmware for iPhone 5, iPhone 4S, iPhone 4, iPhone 3GS, iPad 3, iPad 2, iPad 1, iPod 4G & 3G Touch devices. Soon after the released of iOS 6 3D Maps for iPhone, iPad and iPod, Apple removed the official Google 3D Maps Application from its iOS App Store to promote its newest iOS 6 3D Map Application but with the use of iOS Maps many users are complaining about its functionality and features and facing difficulty when using it. No doubt Apple iOS 6 3D Maps is most advanced application for iPhone, iPad and iPod users but Apple also should consider the alternate of its Map Application and should provide other platform of Map Application like Google Maps Application and Nokia Maps Application which are also capable enough and provide useful and most advanced features to iPhone 5, iPhone 4S, iPhone 4, iPhone 3GS, iPad 3, iPad 2, iPad 1, iPod 4G & 3G Touch device users. In this tutorial and guide we will provide you a method and way to Replace iOS 3D Maps and Install Google 3D Maps and Nokia 3D Maps in Apple iOS 6 Firmware for iPhone, iPad & iPod. 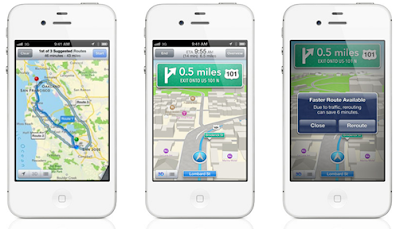 If you are one of the user of iOS Map and using iOS 6 Firmware in iPhone 5, iPhone 4S, iPhone 4, iPhone 3GS, iPad 3, iPad 2, iPad 1, iPod 4G & 3G Touch devices and facing problem and issues with iOS 6 3D Maps than you can follow our Tutorial and Guide to Replace iOS Maps and Install Google Maps and Nokia Maps in Apple iOS 6 Firmware for iPhone, iPad & iPod. We have got a solution to Use Google Maps and Nokia Maps in iOS 6 Firmware devices with full functionality and features. With our following tutorial and guide you will be able to Replace iOS Maps and Get Google Maps and Nokia Maps App iCon on your iPhone, iPad and iPod Home Screen with Shortcut iCon of Application. So let’s start tutorial. Step 2: It is a best alternative of Google Maps Application for iOS 6 devices. It will also ask you to "Allow Location Services"
Step 3: On your respective iPhone, iPad & iPod device, Click on the Arrow Button at the top bottom bar. While iPad users can click on the Arrow Button next to the address bar. Step 4: It will pop-up a menu of all options, there you will see “Add to Home Screen” button, Click on it. Step 5: It will ask you to write the name of your desire "Shortcut iCon". After writing, Click on “Add” button. Step 6: You're Done! Congratulations!! You have now successfully installed Nokia Maps and Google Maps Application on your iPhone, iPad & iPod Home Screen with Shortcut iCon. Now whenever you will click on that iCon it will open direct web application of Google Maps and Nokia Maps in Safari browser. The above method is the best alternative of using Google Maps and Nokia Maps on iOS 6 Firmware for iPhone 5, iPhone 4S, iPhone 4, iPhone 3GS, iPad 3, iPad 2, iPad 1, iPod 4G & 3G Touch devices until Google officially launch its Google Map Application on iOS Appstore.